Yesterday, 26 of the Junes 2012, was My rest day at the Wimbledon Championships after My first round match. Every year you will be findings that us very top players (that win on blue clay H1STORY)) have a routines. This year I thought I should break this habit. So I dressed in a special disguises and mixed with you normal people in the grounds of the All of Britain Club, of the Law and Tennis Associations. I wanted to see how it felt to My fans. Here are My discoverings! Upon entering the gate two men offered to look through My GOAT bag and give Me a security check. I agreed after a little fight. 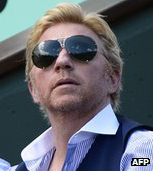 It’s a shame My friend David ‘Soprano’ Nalbandian has already left, he is a good one to have around in these situations. 1. The food was quite acceptable. I sampled everything I could within reasons. Critique? Yes. I discovered I could buy “Fish and Chips”, but not the chips alone. I also may have purchased a burger with the chips but again, these could not be separated. OK for meat eaters. But hardly appropriate for vegetable people. 2. 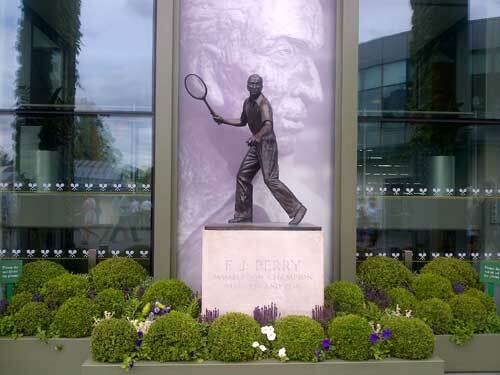 Mr. Wimbledon has placed a generic statue as a gesture as if to say “reserved”. This will be replaced upon My retirement with a bronze statue of Me. 3. Judy Murray (I don’t think she is related to Mr. Wimbledon) should be commended for her tireless work for tennis. Seriously, she is always there with her players and she doesn’t mind mixing with normal people (odd). She supported many players today as she is the top boss for one of My organisations, the Fed Cup. If the Queen does not honour her as Lady Judy Murray I would be willing to visit her palace in Buckingham and fire her. 5. There is a part of Mr. Wimbledon’s garden that apparently used to be named after a player. He was from a long time ago when the world used to be in black and white and it was named, “Henman’s Hilltop”. After a short discussions one of My fans today renamed it, “Humble Hill” in My honour which I accept. So please refer to it as this from this moment onwards in time. 6. During the evening I walked passed Mr. Harmans. He is one of Britains finest and this year is celebrating his 25th Championships. His tweetings name is: @NeilHarmanTimes – unfortunately we were both in a hurry so he did not get the pleasure of meeting Me. What did I learn from Mr. Harmans in such a short moment? Immaculately dressed, almost to My standards and also insists of mixing with the normal people (odd). 7. There are Wimbledon Shops where you are able to buy little gifts to remember the day you came to see Me. I encourage you to buy some mementos if you get the opportunities. However, they sell some tennis balls that are of an incorrect size. Do not try to play tennis with these please as they are the size of footballs. I also noticed the shop items had price tags which surprised Me. I think this is because of the credit crunches and the degradable banks. All in all this was a fun experience. Would I recommend you visit where Mr. Wimbledon lives? Yes. It’s certainly a lifetime ambition for each and every one of you, especially if I am playing. Would I recommend for someone to be a normal person? No. Fascinating, Maestro! Thank You for Your insights, they are so profound. I look forward to visiting Humble Hill. I am curious, though. At Wimbledon today I saw a tall man with hair like Yours (and a dumpy wife) hand his hat with Your RF logo on it to Rafa Nadal for his autograph. Was that You in disguise? And may I have the hat, please? I thought you would have liked it renamed as “Mirky’s Mound” …. no??? Wow, You are indeed so #humble! I thought there would be a statue of Your GOATness made of GOLD instead of bronze. Truly #humble! Thanks for letting us know the plans Mr Wimbledon has for the grounds after Your retirement. P/S: I can’t wait to see what they would do at Roland Garros for the one with #HIS7ORY #VamosRafa! Your Greatness, it is most humbling for me to be able to receive Your fine wisdoms, I feel very blessed. It would indeed be a fine acheivement for Judy Murray to be honoured by You (via the Queen – I know You are too humble to claim the credit!) however I feel that first and foremost the Great British public should be honoured by You becoming Lord Roger of Wimbledon and Common so that your specialness can be bestowed upon the whole nation. I see one of Your many adoring fans has suggested “Mirky’s Mound”. Mirky, I feel sure, would love to have You celebrate her very own Lady Garden which the Wimbliedon gardeners attentively keep neatly trimmed at all times, I believe they pay special attentions to the large bush in the middle. It has been an honour to speak with you so inimately. PS I too am a huge fan of Margaret Mayhem (such a cutie!). Do you have another little doggie fan by the name of Pierre Djokovic? I would like to reply to your humble post, but something tells Me I shouldn’t. Since Athena 1949 mentions you possibly asking Rafa for an autograph, might I suggest next time you give him one of your Nike underwear? It seems to me that Nike has issued him some inferior gear, since he always has some problems with it (it creeps up to him so it seems). For sure Rafa would be most pleased, no? Your organisation Fed Cup…hahahaha. Brilliant again.